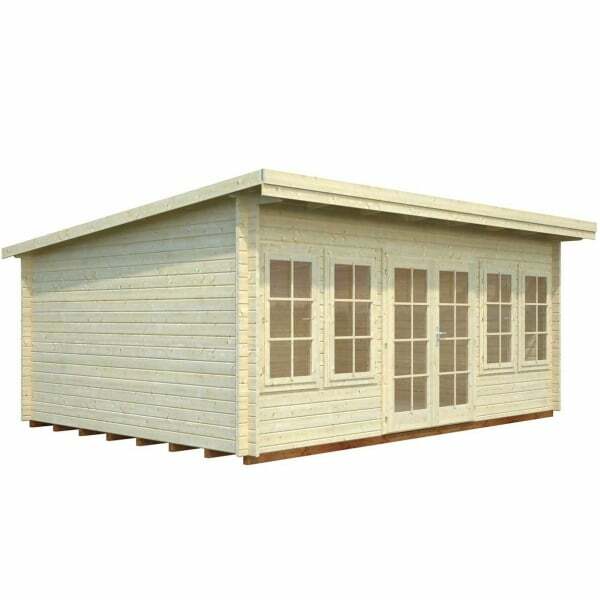 Palmako Lisa 19.4m² Log Cabin: The Palmako Lisa 19.4m² Log Cabin is a very attractive Double Glazed 44mm log cabin. The Palmako Lisa 19.4m/sq Log Cabin is light and airy due to the large fully glazed doors and large windows (all glass is DOUBLE GLAZED). With a Maximum Height of below 2.5m this lovely building provides ample space whilst also giving great headroom inside the Log Cabin. The Palmako Lisa 19.4m² Log Cabin is an ideal extension to the living area for use as a Garden Office, Home Gym, Children's Playroom, or as Mum or Dad's retreat in the garden. These Log Cabins offer excellent levels of insulation and can comfortably be used all year round. Outward Opening windows made of laminated wood with Full Assembly Instructions.